things i thought when my thoughts thought without me or thingsithought.today is an online visual poetry anthology that acts as both a disciplinary exploration, and a portal to my inner world during a turbulent mental health period (read more here). 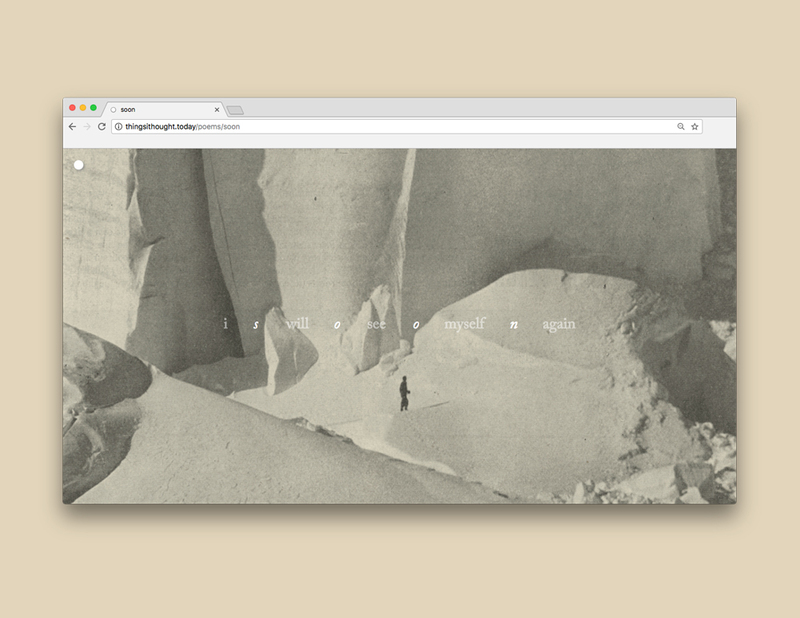 As the culmination of a year-long investigation of visual poetry, the site explores how sound, motion, interaction, typography and imagery might affect and complicate the meaning of poetry. Furthermore, through the use of these devices, the project looks to expand visual poetry beyond the static, printed pieces that have defined the discipline historically. Learn more about the research and experimental works that led to this project here. 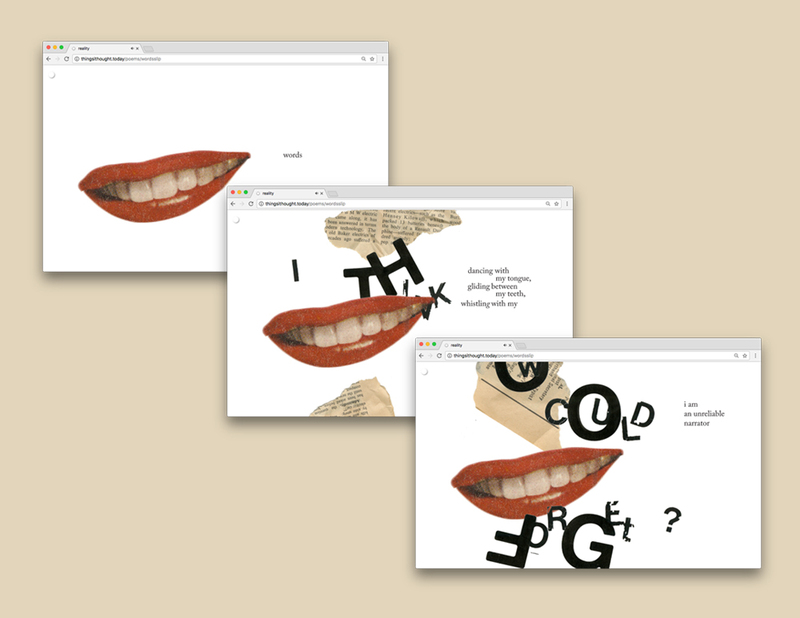 A self-authored online visual poetry anthology that incorporates sound, motion, interaction and collage for a fully immersive “reading” experience. 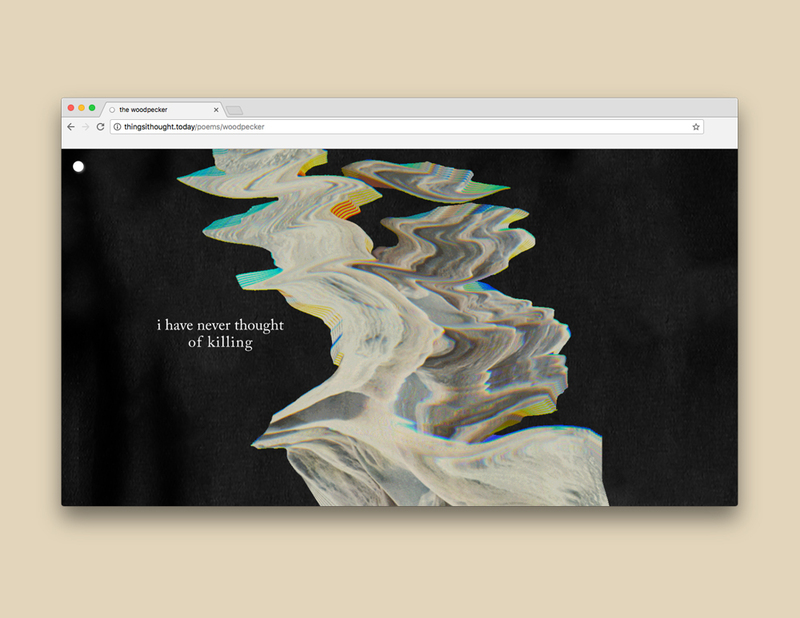 thingsithought.today consists of eleven fully immersive poems that incorporate collage, bizarre gifs, hover interactions, and animated typography. 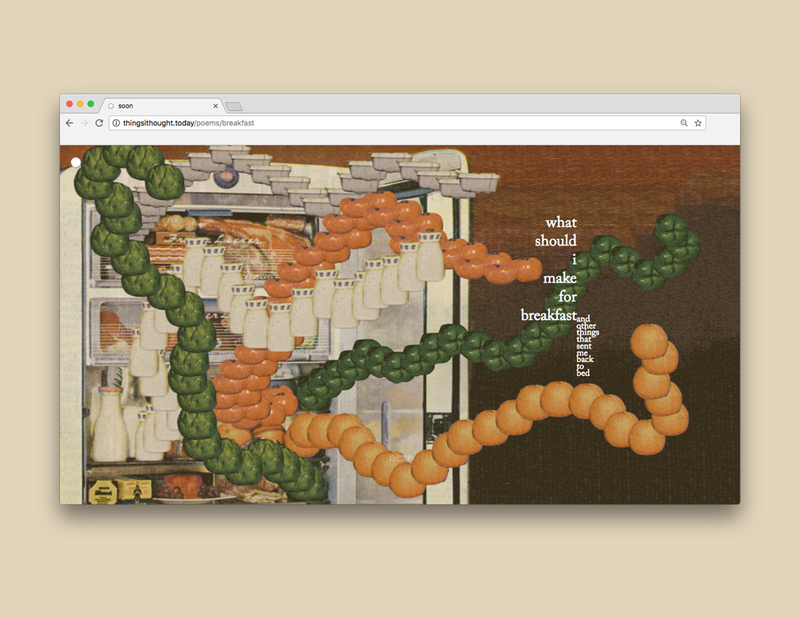 As the user scrolls, they progress through each poem and its associated imagery, allowing complicated and ever-shifting relationships to form between text and image. Ambient sound also plays throughout each poem, acting as a sort of auditory “diction” that sets a mood or implies a specific setting for each piece. The result is a consuming poetic experience which has begun the process of unpacking interaction and motion as visual rhetorical devices. What’s more, the site helps to destigmatize mental illness through its frank and accessible tone, and then redirects suffering individuals to relevant support services. thingsithought.today was selected as the winner of the Forge Award for Typographic Design, part of the annual Association of Registered Graphic Designers’ (RGD) student awards contest. The project will be exhibited at Design Thinkers 2017, included on the RGD website, and will be featured in a print publication of all of the 2017 RGD Student Award winners. This project also won an Applied Arts Student Award for website design, meaning it will be published in the October 2017 edition of the magazine.